The third bone-breaking, belly-busting adventure in the series that puts the “funny” back in, um, funny series. That didn’t really work, did it? 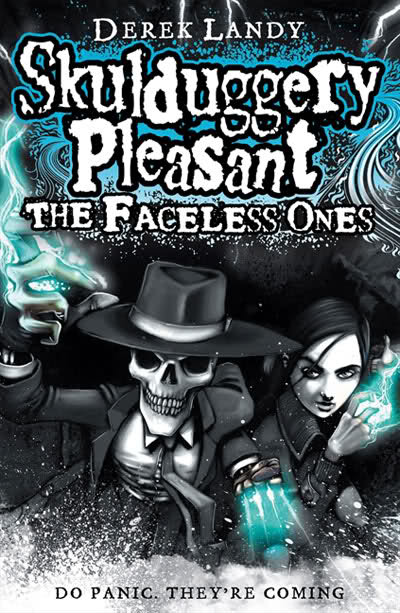 If you’ve read the previous Skulduggery books then you know what the Faceless Ones are — and if you know what the Faceless Ones are, then you can probably take a wild guess that things in this book are going to get AWFULLY sticky for our skeletal hero and his young sidekick. If you haven’t read the previous Skulduggery books then what are you doing reading this? Go and read them right now, so that you know what all that stuff in the previous paragraph was about. Done? Good. So now you’re on tenterhooks too, desperately awaiting the answers to all your questions, and instead you’re going to have to wait to read the book. Sorry about that. I think this description from Goodreads is very good. And is totally what I feel. Writing reviews on books in a series is harder than writing a review on a stand-alone novel. I think I am fairly good at not writing any spoilers, at least I try really hard not to do it. The only thing I can really say about it, is that it feels like Landy is getting more into this world he has built and his writing style. It feels like he has landed and found something that works. I also see kind of a pattern now after three books. The endings are true cliffhangers with something going terribly in the wrong direction right after a small victory. At first I thought that they always saved the day at the end, but not really. And I like that. The books float together and is just spiraling downwards. How will it end? I get more and more hooked after each book. I wouldn’t be surprised if I finished them all before 2019. It was slightly sharper than the first two, therefore it gets a 4.5. This entry was posted in Book Reviews and tagged 4.5 out of 5, Derek Landy, fantasy, HarperCollins, Skulduggery Pleasant by Alexandra. Bookmark the permalink.